This photo ran in Tuesday's New York Times with a caption describing the garment as a Jil Sander "beaver coat, longhaired on the top, shirred below." Shirred is a perfectly good fashion word -- shirring is gathering fabric on a cord or thread(s) -- but I don't see any shirring on that coat. I think the lower section is actually sheared, i.e., cut shorter than the fur on top. The author, Cathy Horyn, certainly knows the difference, but she probably never saw the photo. Whoever provided the caption probably heard "shear"; the editor who wrote the caption was similarly clueless; and shirred is fine with spellcheck. It's just not correct. I don't think this can be an eggcorn, because I doubt that the people who put it into print gave a thought to what shirred might be referring to. Which reminds me of another tidbit of wisdom from the Old Editor: "If there's a word in the text you don't understand, and you let the text go, you haven't edited it." I'm still curious, though, about the original mishearing. Sheared and shirred aren't homonyms for me -- shirr sounds like "sure," not "sheer." Is there any dialect in which the two sound the same? The language of "Parade's End"
"Downton Abbey" is hibernating for now, but anachronism-seekers can divert themselves, starting tonight, with the BBC-HBO production of "Parade's End," the WWI tetralogy by Ford Madox Ford. I'm guessing there will be far fewer goofs per hour in this visit to Edwardian England: Julian Fellowes, after all, has to make up "DA" as he goes, while Tom Stoppard, the scriptwriter for "Parade's End," had 800-some pages of genuine 1920s literature to draw on. Besides, if the series is anything like as complex as the books, we'll have our heads full just following the plot. If a fellow chooses to justify his seductions of uninteresting and viewy young females along the lines of freedom and the rights of man, it’s relatively respectable. It's tempting to read this as meaning "showy" or "eye-catching" -- one of the senses the OED provides -- but the context makes it clear that viewy here (and commonly, in Ford's circle) means "having views," politically opinionated in one slightly disparaged way or another. In both senses, the word dates to the mid-1800s, and it attracted some unfavorable notice from the language watchers of the era. Ford's "viewy young females" are probably would-be emancipated women like the suffragette his hero falls for. Each knew the names of birds that piped and grasses that bowed; chaffinch, greenfinch, yellow-ammer (not, my dear, hammer! ammer from the Middle High German for "finch"), garden warbler, Dartford warbler, pied-wagtail, known as "dishwasher." It's true that the hammer in yellowhammer is not related to hammer "tool for pounding nails." But that doesn't mean the h in yellowhammer is a mistake, according to the OED (as of 1921). Though the source isn't certain, "connection with or assimilation to Old English -hama, Old High German -hamo covering, skin, feathers ... seems probable, and the form yellow-ham n., which may go back to an Old English type *geolo-hamathe yellow-feathered bird, gives support to the hypothesis." Thus, "both forms -hammer and -ammer are historically justifiable; Yarrell's proposed rejection of -hammer (see British Birds, 1843, I. 446) is based on insufficient evidence." As Man of Intellect, Campion was convinced, Tietjens was dissatisfied with his lowly job of draft-forwarding officer, and wanted a place of an extravagantly cooshy kind in the general's own entourage. Cooshy, more commonly spelled cushy, was recent slang when Ford wrote; the OED's earliest citation is dated 1915, and like most of the examples, is in the context of military service: "The billets here are very good ... and we have rooms to ourselves ... It's all very cushey and nice." Cushy (from the Hindi ḳhūsh, "pleasant," says the OED, or maybe Romany kushto, "good," says slangmeister Jonathon Green) also described a not-serious injury: "All our men who have had the luck to get a 'cushie wound'" (1917). The duchess had delivered, apparently, a vindictive, cold, calm and uninterruptible oration on the wickedness of her country's allies as people who [had] allowed France to be devastated, and the flower of her youth slain in order that they might put up the price of a comestible that was absolutely needed in her life. The odd thing here is that the comestible in question is coal. And though it's easy enough to metaphorically equate food and fuel, I've never heard comestible (from the Latin for "eat up") used of anything except edibles. Did Ford simply misunderstand the word? They say you ought to give a lover a chance of a final scene before leaving him or her for good. Still more your mother. That was jannock. Jannock is "a modern dialect word," says the OED, meaning "fair, straightforward, genuine." It may be connected with jannock, a Northern English oat bread or oatcake, and in the 1860s, contributors to Notes & Queries enthusiastically embraced the connection. From the bread, one wrote, "the word 'jannock' comes to be used in Lancashire as meaning 'without deceit, no cringer, sincere, straightforward, independent, &c.,' and it well expresses the character of Lancashire men, who for the most part are blunt and homely, like their jannock, if you like, but straightforward, sincere, and independent." Another 1860s writer asserts that jannock was brought to America by the Puritans, where it morphed into johnnycake. This claim is repeated in recent food writing, including the Oxford Encyclopedia of Food and Drink in America, but I haven't seen any supporting evidence. And a scholarly doubter points out that "this explanation does not take account of the fact that ... 'oat cake' had not been part of the diet of the 'southern lowland' emigrants to New England." OED, please put johnnycake on your priority list! Some people watched the Oscars last night, I hear. 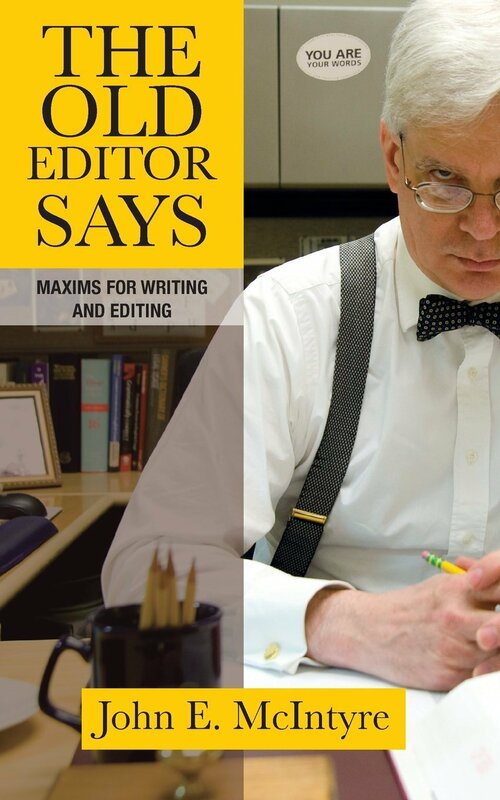 I curled up with a good book instead: John McIntyre's collection of newsroom wisdom, "The Old Editor Says: Maxims for Writing and Editing." It's not a long book, but for me it was a concentrated dose of nostalgia (for the copy desk days) with a chaser of relief (that I no longer work at a daily newspaper). You can't fatten poor stock. Or, as Anthony Trollope wrote, "One cannot pour out of a jug more than is in it." In editing, you can't make any text better than its inherent worth. Much routine editing involves taking texts that are defective -- sloppy, unclear, unfocused -- and rendering them merely mediocre. No more spoilers: For the rest, check out the links at You Don't Say or proceed directly to Amazon. The Yanomamö, like anthropology subjects everywhere, regarded the note-scribbling scholar as a choice target for practical jokes. Only after months of effort did Mr. Chagnon learn that his informants had been deliberately feeding him bogus names. Naturally, he found out in the most humiliating way possible: Telling a group of men something about a headman's wife, he unknowingly referred to her by a capillo-vaginal epithet. Apparently the WSJ's rules for taboo avoidance allow for a cuteness factor; I don't think the New York times would find "capillo-vaginal" amusing enough (or, perhaps, obscure enough) to pass muster as printable euphemism. Luncheon had been used to refer to a meal since the 17th century, but the dictionaries' treatment of lunch and luncheon as synonyms seems not to have bothered people for most of the 19th century. The OED’s first cite for lunch, in fact, suggests that London's smart set liked the shorter term: "The word lunch is adopted in that 'glass of fashion,' Almacks [a popular club], and luncheon is avoided as unsuitable to the polished society there exhibited," reported Henry Best in 1829. But by the end of the century, some American word watchers (and some etiquette mavens) were trying to pick a fight over lunch. "This word, when used as a substantive, may at the best, be accounted an inelegant abbreviation of luncheon," wrote Alfred Ayres in "The Verbalist" (1881). "The dictionaries barely recognize it." Ambrose Bierce banned lunch in "Write It Right" (1909), as did newspaper editor Robert Ransom in his 1911 usage guide. Josephine Turck Baker, in "The Correct Word, How to Use It" (1920), claimed that luncheon was "the preferred form of the noun, lunch being properly restricted to express action; 'Luncheon is ready;' 'They lunched on crackers and cheese.'" Maybe these complainers thought (wrongly) that lunch was an American barbarism; many usages were condemned on no better grounds. But their grumbling had no effect. Luncheon was fine for a fancier affair, but nobody was prepared to abandon plain lunch. As a peeve, this one finishes way back in the pack, not remotely a contender for the Peevy Award. And anyone who visits "Lunch Hour NYC" will understand why; the Automat was a wonderful invention, but nobody plucking a meal from its shiny compartments would be tempted to call that meal "luncheon." *It's at the so-called main branch, at Fifth Avenue and 42nd Street., through Sunday (Feb. 17). For me, "main branch" is unsettlingly oxymoronic; don't most systems have a main library and branch libraries? The peeve to beat all peeves? Arnold Zwicky thinks the peeve about the meaning of decimate should get a prize for its persistence in the face of usage facts: The Peevy for Lifetime Achievement. We could debate the merits of the hopefully peeve as a rival candidate -- its heyday was much shorter, but the argument was often hotter, given that hopefully was a more common "transgression." But there's no debate about the prizeworthiness of the decimate question. Here's an excerpt from the column I wrote about it in the Boston Globe (July 1, 2007), after a reader insisted that "To decimate means to reduce by 10 percent, as was done by the Roman legions." So it does, when you're speaking of the Roman Army, or of others who copied their harsh punishment for mutinous legions. But as an English word, decimate has always had a wider scope. Since the mid-17th century, says the Oxford English Dictionary, the word has also been used to mean "destroy or remove a large proportion of." Nobody objected, it seems, for more than two centuries; there was the military decimate and the loose, emphatic decimate, each in its proper place. But in 1870, according to Merriam-Webster's Concise Dictionary of English Usage, the popular American language commentator Richard Grant White declared war on the degraded decimate. White inspired some followers, but the purists met resistance from the start. In an 1885 essay, writer Grant Allen rebuked the "superfine English" crowd, saying there was "surely nothing very wrong or out-of-the-way" in expanding the sense of decimate. If you pine for the classical decimate, though, you have a champion in [the late] language columnist William Safire. When he first addressed decimate, 25 years ago, he agreed with Fowler: "To limit the word's meaning to 'one-tenth' would be like limiting myriad to its literal '10,000.'" But a few years later, he quietly flip-flopped, warning readers that "unless purists persist, decimate will come to mean 'destroy a large part of.'" In 2004 he reaffirmed his faith: "Decimated means reduced by 10 percent." But he was right the first time. If etymology governed usage, as he noted, we'd have to stop using myriad for "lots" -- and journal for anything not published daily, and honeymoon for wedding trips shorter than a month. That way lies lunacy. Besides, we don't especially need a term that means "kill one in 10." As Barbara Wallraff notes in her book "Word Court," you're free to use decimate only in the narrow sense -- but "in that case, you won't be using the word very often."